LOS ANGELES, Nov. 17, 2017 /Standard Newswire/ -- Officials of the Archdiocese of Los Angeles held an historic tribunal session to begin the official Sainthood Cause for Servant of God, Aloysius Ellacuria, CMF. 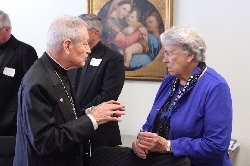 After the opening prayer, Sr. Mary Elizabeth Galt, BVM, Chancellor of the LA Archdiocese, introduced the proceeding. Dr. David Salvato, JCD, acted as Tribunal Notary. He administered the oaths to Episcopal Delegate, Fr. Joseph Fox, OP, to Tribunal officials, Commission members, and Dr. Andrea Ambrosi, Postulator. Bishop Placido Rodriguez, CMF attended as did representatives of the Association for Father Aloysius Ellacuria, CMF. Fr. Aloysius was a well-known member of the Claretian Missionary congregation who worked for over 30 years in the greater Los Angeles area. He served for most of those years in religious and priestly seminary formation. He acted as director of several of the Claretian Guilds - from the 1940s through his death in 1981. His ministry included spiritual direction of the very poor, the sick and the dying. He was considered a holy man, a mystic, and a miracle worker. During the 1960s he served as pastor of two parishes, Immaculate Heart of Mary in Phoenix and then, Immaculate Heart of Mary in San Antonio, Texas. During the last 10 years of his life, he founded a missionary order of men in Fatima, Portugal, the Missionaries of Perpetual Adoration. They are located presently in Alamos, Sonora, Mexico. His sainthood cause opened in June 2015. It was postponed until today's session. Members of the Tribunal will now begin their investigation into the life and ministry of Father Aloysius. The Catholic Church's process leading to canonization involves three major steps. First is the declaration of a person's heroic virtues, after which the church gives the title Venerable. Second is beatification, after which he or she is called Blessed. The third step is canonization or declaration of sainthood. This is an historic moment for the Archdiocese of Los Angeles, as the Father Aloysius cause of sainthood is the first ever to be opened in the Archdiocese of Los Angeles. For more information contact: Fr. Kevin Pius Manion, 512-773-5447.